Warrenton, Va. (June 22, 2018) – Patriot Group International (PGI) announced today that it was named a 2018 Top Workplace by The Washington Post. This year marked PGI’s first appearance on list, which honored 150 organizations in the Washington, D.C. metro area, including private, public, nonprofit and government agencies. The Top Workplaces are determined based solely on employee feedback. The anonymous employee survey is conducted by research partner Energage, LLC with evaluation factors including the quality of leadership, pay and benefit practices, work-life balance issues and more. Earlier this year, PGI was honored as the third best small company to work for in the 2018 Best Places to Work in Virginia, the list created by Virginia Business and Best Companies Group that recognizing the best employers in the Commonwealth. 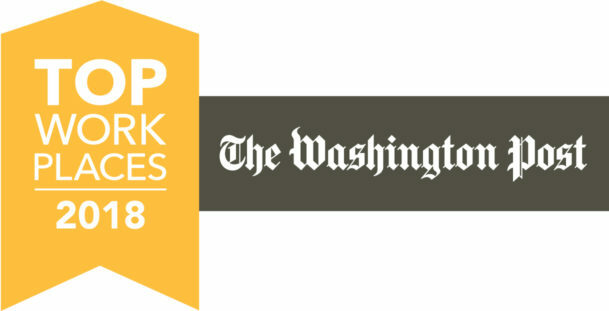 The Washington Post hosted an awards ceremony on Thursday, June 21 to recognize the top-ranked companies. For more about The Washington Post’s Top Workplaces and to see the full list of this year’s honorees, click here.